Cardiovascular disease (CVD) causes 45% of on-duty firefighter fatalities, a high fraction even when compared to the risk of CVD found in other first-responder professions like police work and emergency medical services. Monitoring and managing firefighter cardiac health is important for both individual health and public safety. In our study, we are interested in assessing the utility of the most commonly used risk assessment scoring, known as the Framingham Risk Score, in evaluating the atherosclerotic risk in asymptomatic firefighters. To this end we determined FRS for 159 male firefighters from Gwinnett County, Georgia, and compared their risk categorization against their known atherosclerotic burden as determined by CIMT and CAC. While the 20% FRS threshold, corresponding to medium risk, had a high specificity for both CAC and CIMT, it also had a low sensitivity (17% and 40%, respectively), indicating that a large percentage of individuals with clinically significant atherosclerosis are being misclassified. By adjusting the FRS threshold downward, we were able to raise the sensitivity greatly with only a modest loss of specificity. Following percutaneous transluminal coronary angioplasty for the treatment of coronary artery disease, stents are commonly implanted at the treatment site to prevent recoil and negative remodeling. To combat in-stent restenosis, an arterial healing response that results in luminal loss in stented arteries, anti-restenotic drugs like sirolimus (SES) and zotarolimus (ZES) are commonly eluted by stents to suppress cell proliferation at the treatment site. While comparative studies have revealed significant difference between bare metal stents (BMS), SES, and ZES in both clinical and histological arterial response, the molecular basis of these differences remains poorly understood. We conducted a comparative gene expression profiling study using microarrays to examine differences in gene expression and pathway function in coronary arteries exposed to ZES, SES, and BMS in a porcine animal model. These molecular profiles suggest a model of delayed restenosis, resulting from a drug-induced suppression of inflammatory responses and proliferative processes, rather than an elimination of restenosis. microRNAs play a regulatory role in metastasis-related epithelial to mesenchymal transitions and mesenchymal to epithelial transitions in ovarian cancer cells. We previously showed that over-expression of miR-429 in ovarian cancer cells drove a transition from mesenchymal phenotypes to epithelial phenotypes both in morphology and expression of markers like ZEB1, ZEB2, and E-cadherin. Our study represents the first time course analysis of miR-429-induced MET in ovarian cancer cells. We transfected Hey cells with miR-429 and assayed gene expression over the course of 144 hours at regular intervals. The cell morphology and gene expression of our transfected cells changed to become more epithelial-like at 24 and 48 hours and then became more mesenchymal-like by 144 hours. By 144 hours the average gene expression levels for 98.6% of our genes were not significantly different from the levels they started from at 0 hours when we adjusted for baseline expression changes observed in our negative control treated cells. This suggests the use of microRNAs as cancer therapies and driving cells to a more drug susceptible state. 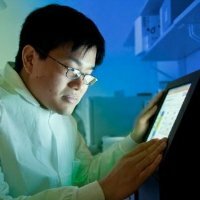 On August 5, 2014, Bioinformatics doctoral student Andrew Huang successfully defended his thesis, "Computational Analysis of Gene Expression in Complex Disease."